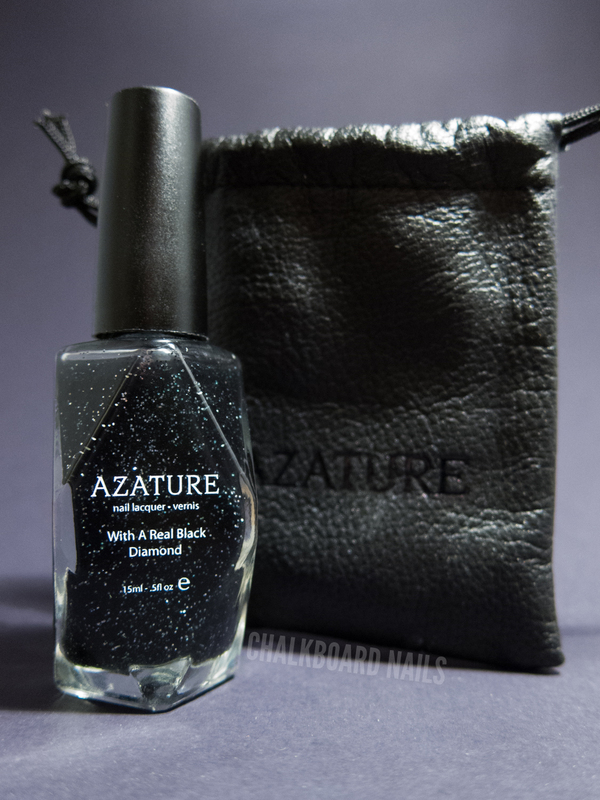 Today's post is a swatch of the "consumer-friendly" version of Azature's Black Diamond nail polish. Azature is a Los Angeles based fine jewelry designer that specializes in black diamonds. The original bottle of their polish contains 267 carats of black diamonds and retails for $250,000. This version contains one black diamond and retails for $25. There's a bit of a difference in price point for you, huh? My bottle arrived in this luxurious leather drawstring pouch. The bottle shape is cool too, faceted like a diamond! In the bottle, it looks like a black polish with silver glitter. 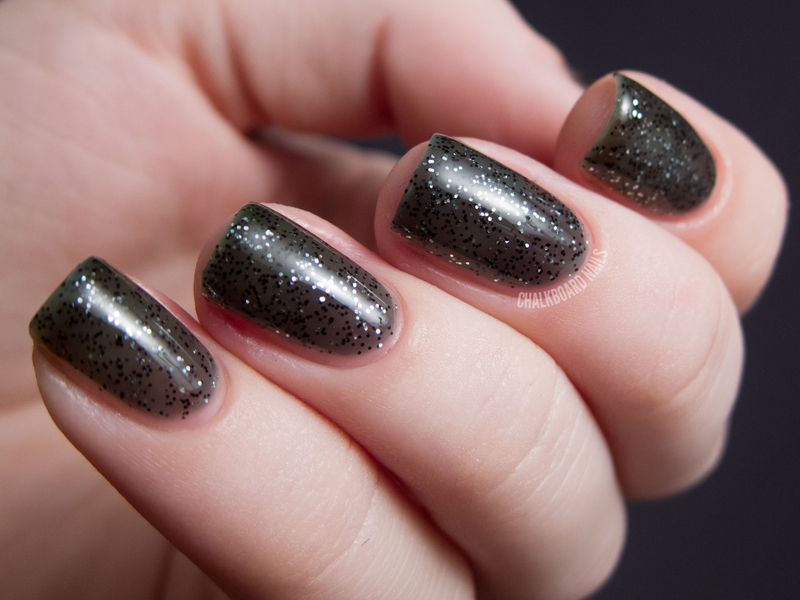 But instead, it is a grey jelly with silver and black glitters. The polish is delicate and beautiful, while still retaining a bit of an edge. It was intended to be reminiscent of the sparkle of a black diamond, and I think that Azature did a good job with that. You guys know I love black glitters, so that was immediately appealing to me. This polish actually reminds me of something that an indie brand would put out (that's a good thing)! The jelly base is thin, which allowed the different depths of glitter to show well. However, because of this, the polish required four coats to get to the opacity you see here. I haven't tried layering this polish over a creme yet, but imagine that would both solve that and completely change the look of this polish. I guess it's a matter of what is most important to you: opacity or depth? If you want it to look the way it does in the bottle, I'd suggest putting it over a black creme. The formula on this was good. It applied easily and wasn't lumpy, like some jellies can be. The glitters aren't gritty, either. When applying, I would recommend giving it a bit of extra time between coats to set to prevent pulling of the previous coats. Add a layer of topcoat to boost the shine and you're good to go! Final thoughts: this is a pretty polish and a unique look from a larger manufacturer. Is it worth $25? It depends. The formula is good and the final effect is nice, but the number of coats required will be a drawback for some. In the end, you may be paying for the brand and the novelty of the black diamond. But isn't that the way it is with most luxury polish? Azature Black Diamond is sold on Ron Robinson for $25 per bottle. The product in this post was provided to me by the manufacturer. EDIT: I've heard back from Azature and the black diamond in the bottle is whole. The size may vary by bottle but the texture is different and distinguishable. EDIT II: Due to a ridiculous amount of spam comment attempts on this post, I have shut off commenting. Please feel free to email me with questions or comments. I did it on my blog awhile ago. With one coat all the way up to 3 or 4 coats. I didnt agree with her post about it as much. But to each there own. I'm with Fitzy. I'm sure I can find a much cheaper dupe that's close enough to satisfy me if I wanted something like this. Your photos are great, but I have to say I'm not impressed with the look of the polish even though I love black polishes, black and silver glitter. This one lacks something. Perhaps the opacity, perhaps something else. What a stunning unique shade!! It's a nice polish but for all the back story and the price, it doesn't have that wow factor. Really great swatches! But I'm wondering what role the black diamond plays in this polish? Is it grinded into such tiny pieces that we can't see it anymore, does it make the jelly black/grey, or is it suppose to be the glitter pieces? The glitter looks just like glitter to me, not diamond. I don't understand this trend! I too am curious to know where this one black diamond is in this whole polish? So strange. Though pretty, it's definitely not worth the price tag I don't think. I think the diamond is ground up to make the glitter. Waste of a diamond, IMHO! Hey guys! I've found out that there is a whole black diamond inside. The size may vary, but it's in there! Definitely more my price point and I'm digging that it's a jelly! Yeah- I don't know if I'd spend the 25 bucks on this but I do love that it's a gray jelly- really unique! I think Zoya'z Storm from their Holiday Ornate Collection is the "wow" version of this polish... have you swatched that one? Not yet -- it should be arriving soon. Yeah, I was just gonna say that I MUCH prefer Zoya - Storm! I like it! I bet it would be even more gorgeous over a black cream like you suggested. It's definitely pretty but I probably wouldn't be inclined to pay $25 for it. I like it, maybe not $25 dollar likeing it, but still its cool looking polish. Like the above posters I would love to know more about this Diamond. Is it ground up and part of the pigment in the polish? or is there an actual small diamond in there? Would love to know the deal with that. Really expensive but honestly - so gorgeous! Ahhh.. So it's a whole black diamond in there? I was wondering about that. I was thinking if it was just ground up, diamond dust, then so what? Diamond dust in polish isn't terribly new, and they use industrial grade diamonds for that anyway. It's a little more interesting that there's a whole diamond in there but... Perhaps a bit too gimmicky? I'm not sure who I feel about this one, honestly. I typically enjoy novelty, but this doesn't draw me in at all. I love grey jellies, but the price is too much for even a quality polish but not enough for a quality diamond. But then I don't care about gold flakes in my alcohol, either, so I guess if it does draw a person in and gives them the feeling of luxury then $25 isn't a lot to pay for luxury. To each their own, and for me 3 Zoyas instead. I have it and loveeeee it! I used it over black and its gorgeous. Price point or not, novelty aside in person it's really pretty. I was pretty shocked at the 250K price. I'm glad to see swatches of the cheaper version. I love dark polishes, especially if glitter is involved. I don't think I'd pay $25 for this though! Wowzers that so so expensive! I had wanted to see good swatch photos of this consumer version of this baby ever since watching the Emmy Awards and Kelly Osborne had the 250K version on her nails. I did not like her nails (esp for the price) and sad to say I would not spend $25 for this version of it either. It's a big old fail in my book. If I were going to spend that price on a bottle I would put it toward a Chanel I really wanted or another high $ end brand...but thanks for giving us such a good look at this curiosity. So is that just silver and black glitter suspended in the nail polish and somewhere in the bottle is a real diamond floating around? I'd probably layer this over a colored creme or shimmer, I love the wearing a bright color under a black jelly, how it looks black until you get it in the sun and the color pops out! Gorgeous swatches, I'm in love.